Heritage Minutes are as Canadian as bagged milk, toques, and apologies. Under the tutelage of these slickly produced, one-minute television spots, an entire generation of Canucks learned about key moments and characters from the pantheon of Canadian history – like the Halifax Explosion, Laura Secord, the Underground Railroad, Winnie the Pooh, illiterate school trustees, and how sawing the bottom off of a peach basket put the basket in basketball. And they’re iconic. Show me the Generation Xer who doesn’t immediately perk up at “Burnt toast! Dr. Penfield, I smell burnt toast!” and I will show you someone who didn’t watch Canadian television in the 1990s. More than 50 Heritage Minutes were produced during the program’s prolific initial run (1991 to 1995). The initiative returned in 2012, and the latest Minute – released late last month – utilizes a Vancouver cast and crew to amplify the story of the Vancouver Asahi. Founded in 1914, the Asahi were the pride of Vancouver’s once thriving Japantown neighborhood. The amateur team played out of Oppenheimer Park, Japantown’s geographic and emotional centre, and its players were Japanese Canadian men from the surrounding area. The Asahi developed and employed a technique called “brain ball,” and won 10 city championships between 1919 and 1940. But following the attack on Pearl Harbor in December 1941, a wave of anti-Japanese sentiment swept the continent, and Japanese Canadians – no matter where they were born, or how long they’d lived in Canada – were officially labeled enemy aliens. These Canadians were stripped of their businesses and possessions and herded into internment camps far from the West Coast. 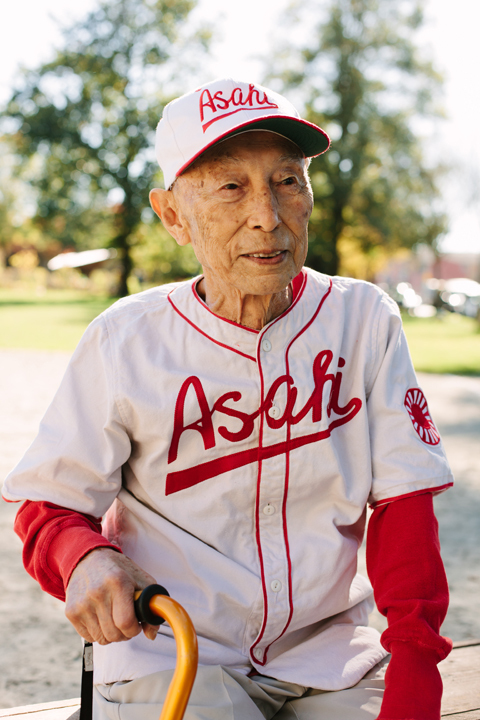 This included the members of the Asahi, who continued to play baseball in the internment camps, despite the indignity of their surroundings and the shoddy way they’d been treated by their own government. In order to distil this huge story down into one broadcast-ready minute, Corkle and co. opted to tell it from the perspective of Kaye Kaminishi, an Asahi benchwarmer who is now 97 years old. Kaminishi provides voiceover for the spot – which documents his journey from the baseball diamond at the Powell Street Grounds to an internment camp in Tashme, BC – and appears in his Asahi uniform in its final seconds (at which point the narration is delivered by poet and novelist Joy Kogawa, whose American Book Award winning novel Obasan is based on her own internment experience). Corkle, cast, and crew filmed on location in Vancouver and Tashme in 2018. For the Vancouver scenes, they shot in Woodland Park instead of where the team actually played in Oppenheimer. “The Japanese Canadian community was displaced from that neighborhood in the 1940s, and there’s a neighborhood of people who live in Oppenheimer Park now, and we didn’t want to show up and displace them in order to film there,” explains Corkle. And so they filled Woodland Park with extras and used visual effects to extend the background. The internment camp scenes were a different story. The production filmed on the grounds of the historic Tashme Internment Camp. Corkle credits the Sunshine Valley Tashme Museum for advising on the project, as well as for lending key props, including a baseball bat that was used by internees when the camp was in operation. The Vancouver Asahi Heritage Minute was produced by Point Blank Creative and was co-written by Graeme Campbell, Candice Vallantin, Kai Nagata, and Corkle. Lou Ticzon portrayed the younger Kaminishi. For more about the Heritage Minutes program, visit https://www.historicacanada.ca/content/heritage-minutes/vancouver-asahi.